*these quick and easy Chicken Meatballs require no chopping or dicing and are perfect for kids and adults! Serve as mentioned here or with your favorite sauce! In a large bowl add all ingredients except for olive oil and mix together well with two spoons or super clean hands. Once mixed together form the mixture into meatballs and place on a plate. In large pan, (I used cast iron) heat up your olive oil until hot (about 3 minutes) add your meatballs and allow them to sit undisturbed so they can brown and crisp ~ about 2-3 minutes. Flip over to brown the other side, again 2-3 minutes. Place all browned chicken meatballs in an oven-proof pan and finish cooking in the oven about 6-8 minutes or until the center is HOT and no longer pink. Coat your cooked pasta with the Pumpkin Sage Cream Sauce then place on a plate. 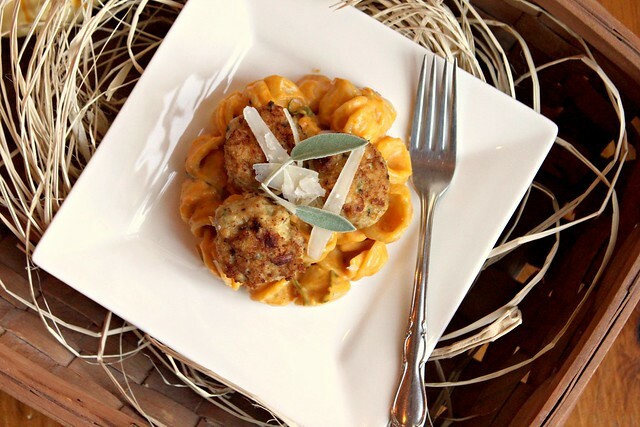 Top with Chicken Meatballs and garnish with shaved Parmesan and sage leaves if desired. (Obviously you can coat the Chicken Meatballs with the sauce too, but I like to see the meatballs atop of the pasta thus adding contrast to the dish.) Enjoy! Sage, chicken, pasta - I sure hope your gang appreciated the inherent qualities of what you put on the table before them. I'm so glad to see that I'm not the only one who uses ground chicken to make some yummy meatballs! This sounds amazing. Really delicious, sage, pumpkin, pasta, WOW YUM! My mouth always waters with your posts. I swear in my entire google reader, I click through on your recipes more than anyone else. Stop, I'm gaining weight! had a divine pici with pumpkin sauce two days in a row in Tuscany. I couldn't get them to send the recipe to me...something about Amanda Knox resentment..don't know. So here you are with the most wonderful saucy sauce and then chicken meatballs. Yum. Gorgeous photos and this dish sound positively divine! Can't wait to try it - probably delicious with a Chardonnay too. Thanks so much for sharing - Cheers! Can you believe I have only made chicken meatballs once? Well, that will change, I will definitely be making this soon! Looks and sounds delicious! I'd say those are 5 good reasons to put the blog aside! Welcome back, and with a beautiful fall dish. The pumpkin cream sauce sounds heavenly! Oh. My. Goodness. I love absolutely everything about this recipe! Gorgeous dish! Happy everything this month, a lot to celebrate!! Well Happy Birthday and Happy Anniversary for everybody and everything! This is a busy month or what! Sage gives such an aromatic touch to a meal. I use it quite often when I am cooking. The dish looks mouthwatering! I broke a big grin about the month of October at your house... Did I mention that my belly made a rumble at the delicious dish too? P.S. Your October is like my November. I can totally relate. Your October sounds like my December: ok, only daughter's birthday, wedding anniversary and Christmas. But, hey,Christmas almost counts like Halloween+son's bday+husband's birthday...well, maybe not. I feel for you! Oh wow, this looks so good and just feels like autumn.